Every now and then… this little blog gives us the opportunity to have some really amazing experiences! Like… trying out new products before they ever hit the market. This is one of those times. Mom Select asked if I would host a movie night with my kids and share about our experience. I was given a small stipend, but I would’ve done it for free. Coming up with inventive ways to spend time with my kids isn’t always easy! 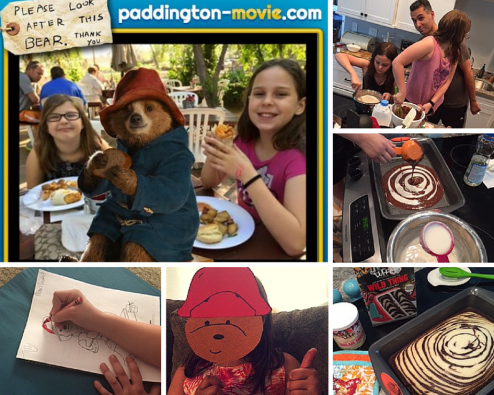 Here’s a step by step guide on how to host a Paddington Movie Night with your family! Step 6: Pop some popcorn and enjoy the show! Our favorite part of our own Paddington Movie Night- was baking a wild stripe cake! I encourage you to find a related activity that your family enjoys to make your own movie night a success! I’d like to thank Mom Select for their partnership in hosting our Paddington Movie Night and for the huge box of amazingly *fun* party supplies! We hope you host your own amazing Paddington Movie Night! Be sure to share the pictures!